Rock Legend Ronnie Spector Recalls Her Close Friendship (and Almost Romance!) with John ... . Beatles Radio: The Beatles, Solos, Covers, Birthdays, News The Fab 4 and More! 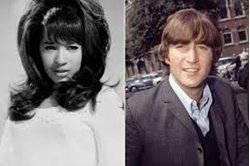 In addition to her title as the original Queen of Rock and Roll, Ronnie Spector enjoys an undisputed status as one of the ’60s greatest heartthrobs. Fronting the legendary Ronettes in her signature sky-high beehive and stylish pencil skirt, the cat-eyed siren bewitched millions, including some of the most famous artists of her generation. Jimi Hendrix and David Bowie were among those who vied for her affections, but few were as besotted as John Lennon. The pair met in January 1964 when the Ronettes toured England soon after their pop masterpiece “Be My Baby” became a global smash. The Beatles, barely a year into their own superstardom, counted themselves as huge fans and wanted to be introduced. “They had seen us on Sunday Night at the London Palladium and they said, ‘We have got to meet these girls with the black long hair and slits up the side,'” Spector, 75, tells PEOPLE. Lennon, however, took the romantic rejection in stride. “He said, ‘Okay, I guess I lost on that one! '” Spector recalls.